There’s an advertisement running on TV that just doesn’t sit well with me. It’s for a prepaid Visa card from NetSpend. The ad promises “No Credit Check. Safer Than Cash. No Bank Account Needed.” It goes on to boast that it’s safe because it’s not a credit card, it’s a prepaid debit card. Okay, when I first saw this ad I thought “Here we go. Sounds like another way to trap people who don’t have credit into to something that’s bad.” But I sort of forgot about. Then I saw the ad again and curiosity got me, I just had to dig deeper. And yes, it is as bad as I suspected. And I believe it’s even worse because it’s backed by Visa. And it’s not jsut Visa that’s in on this game. The MiCash Prepaid MasterCard is even worse, it hits users with a $9.95 activation fee, in addition to the regular fees (as above) that come with these cards. These cards prey on people who do not have credit, have poor money management skills or who may be desperate. It’s kin to the payroll card. They are designed to generate fee income and ruin users. They especially cater to the young people and immigrants. And yes, I’m going to say it…they target Latinos. Because the banking industry knows that immigrant Latinos, more than those born in the U.S., do not trust banks. Because they don’t use banks they are faced with using check cashing or payroll services. 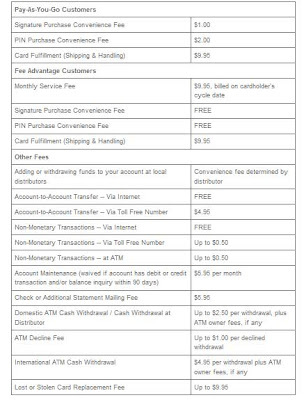 The prepaid debit card poses as a respectable convenience, but when you look at the fees it makes you scratch your head. I cannot tell what the difference is between NetSpend’s Reload Pack and visiting a Reload Center, but I know they both cost money—just to put money on the card! “Instant bank transfers” is another weird term, but I get that it costs money. Okay, I’ve made my point that I don’t like these cards and I really don’t like how the advertising happily touts “No Credit Checks”, but I did wonder how these things were any different than the Visa Gift card. They are vastly different, but it boils down to just a few points. Number 3= Preloaded cards are intended to used by the person who sets them up, Gift cards can be purchased at stores or financial institutions for someone else. my credit union’s BoD charged me with finding/implementing a prepaid debit program earlier this year, but i’ve yet to find a program that isn’t just designed to steal people’s money. i did actually find a few good programs that don’t charge transactional fees or inactivity fees inside of 1 year, but b/c of tough state banking laws, i can’t offer them to my members. so why can i offer these fee-heavy programs but not the consumer-friendly ones? b/c the trap cards are offered by national banks & nationally-chartered banks don’t have to follow our state banking laws. BOO! This entry was written by celestewrites, posted on October 15, 2009 at 11:48 am, filed under Uncategorized. Bookmark the permalink. Follow any comments here with the RSS feed for this post. Post a comment or leave a trackback: Trackback URL. Another too good to be true thing, companies like this should be a shame of themselves. Always tring to make a quick buck.